On the night of February 14, my valentine was another woman without a date. We went to an open mic event where we listened to humorously awful love poetry. Then we ate out, making up for our reduced-calorie entrees with fried mozzarella sticks, and we laughed together over our own horrific love stories (or lack thereof). At my house, we shared red velvet cheesecake brownies while commiserating with each other for our mutual relational struggles. She told me she hates when someone asks her, “Where do you see yourself in five years?” The socially acceptable answer has to do with where you want to live or what kind of employment you want to have. My friend would like to say she will be someone’s wife, someone’s mother. But what control does she have over the ambition for a family? I can’t describe my life in five years either. I complained to her about not knowing where I will be, what I will be doing, or who I will be with in just a few months from now. I have no plans, only daydreams. But of course, even people with rock-solid plans don’t know what tomorrow might bring. Whatever plans we make, life doesn’t give guarantees. My friend remarked that God likes to surprise us, just like a human father does for his children. Being blindfolded might make us nervous as we’re led through the dark, but the surprise is usually worth it. A fist doesn’t receive anything except bruised knuckles. A fist is untrusting. Held at eye level, it can be a boxer’s guard. At the waist, it’s a martial artist’s security against a threat. Down at either side, they are stubbornly demanding. Pounded on the ground, the fist is a child’s temper tantrum. 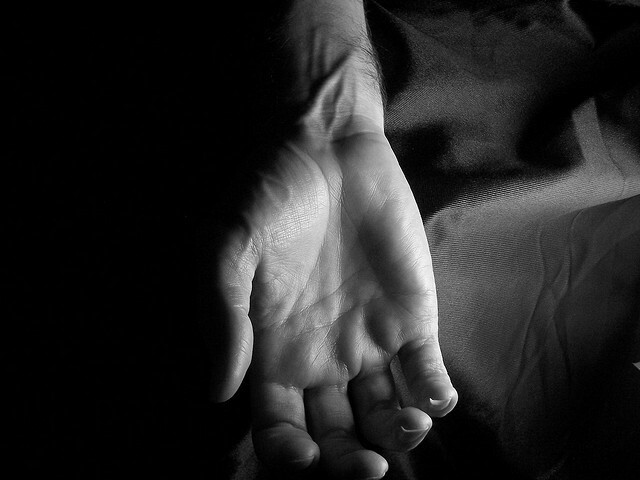 But an open, upturned hand held out…there is vulnerability. It’s the child waiting for a cookie or maybe for medicine. It’s someone offering to hold a friend’s hand through the worst. It’s a sign for giving up and letting go. It’s the release from a tight grip. The open hand is willing and welcoming. I could clench my fists and demand God for answers about my future, or with open hands, I can wait patiently for whatever surprise my Father has planned. It will be worth the wait.